Personally, I love a good tan. It makes you look healthier and slimmer. However, I’m not a fan of tanning beds or laying out in the sun since it’s so harmful to your skin and your health. A great alternative to achieving a nice tan is using self-tanning products. I recently tried Loving Tan Deluxe Bronzing Mousse in Medium and it’s a great product. Loving Tan Deluxe Bronzing Mousse is available in three shades, Medium, Dark, and Ultra Dark. As with all products it has pros and cons. Loving Tan Deluxe Bronzing Mousse has a nice scent. Oftentimes self-tanning products have an unpleasant smell but this one is nice. It provides a natural-looking tan. Some self-tanning products give you an orange look, but this one provides a natural looking olive color because it contains DHA and Erythrulose. It’s long lasting. I applied this on Saturday and it has lasted five days so far. Supposedly it will last up to 10 days if you keep your skin moisturized. It dries fairly quickly after application. It’s Organic and contains natural ingredients. It’s also free of parabens and alcohol. It contains an instant bronzer that gives an instant color boost and acts as a fool proof color guide to show where the product has been applied. You have to move pretty quickly when applying the product because it dries fairly fast and can leave streaks if you’re not careful. It can feel a bit tacky after application but it goes away within a few minutes. You have to avoid water or perspiration for six hours after application so the tan can develop. To maintain the tan you have to avoid swimming pools. Left: Before application. Right: After 6 hours of development time. Pictures taken in outdoor sunlight. As you can see Loving Tan Deluxe Bronzing Mousse gave me a natural looking bronzed look. Overall, I do enjoy this product. It’s not my favorite self-tanner just because you have to work quickly during application and I’ve gotten better results with Tarte’s Brazilliance™ skin rejuvenating maracuja face and body self tanner but it does a nice job nonetheless. 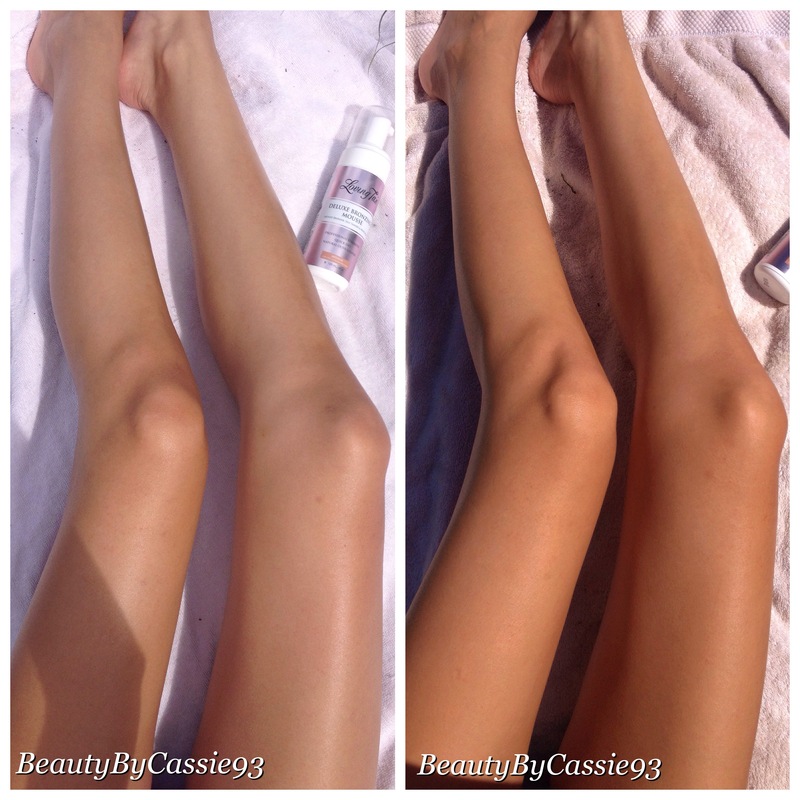 This entry was posted in Reviews, Self-Tanning, Skin Care and tagged Before and after, Loving Tan, Loving Tan Deluxe Bronzing Mousse, Product review, review, self-tanner, self-tanning product.